Beginner's Guide to Digital Painting in Photoshop is one of the better books for learning digital painting with Photoshop. It's published by 3DTotal and follows a somewhat similar style to their Digital Art Masters series of books. It's filled with tutorials that teach the various aspect of digital painting. There are 224-pages and it comes with a pretty plastic slipcase. The book benefits those already with some basic experience in creating art. You should be able to draw first. The book's goal is to help you make the transition over to digital painting by showing you how you can replicate your traditional techniques digitally. Through the illustrated examples, you can also learn how the techniques required to create them. 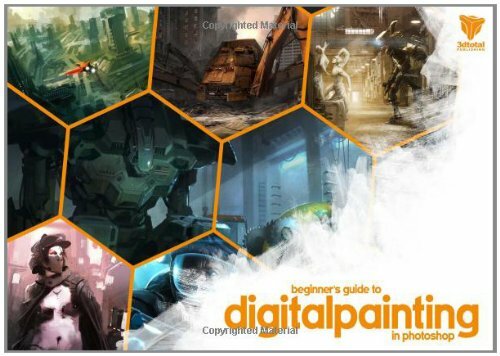 Intermediate and advanced digital painters should be able to find useful tips in the book too. The first section covers the setting up of Photoshop and understanding the interface with regards to digital painting. The author uses Photoshop CS so some of the software features might differ from newer released. But essentially, the basic features should still be around, somewhere. The second second covers the art fundamentals. That would be things like lighting, composition, etc. The insightful commentary reinforces what makes a good painting. The next section is on painting styles and covers painting of fantasy and sci-fi scenes, which is type of subject the book focuses on. There's also a useful section on creating effects and textures, things like clouds, smoke, explosions, trees, skin, fur, metal, etc. All the tutorials are created by professional artists, such as Nykolai Aleksander, Richard Tilbury, Eric Spray, Weiye Yin and more. They have lots of experience and their commentaries show. This is a good book on digital painting. Beginners to advanced users should be able to learn a lot. How friendly is this book for beginners with not much experience at real painting that cannot draw? The problem seems that all beginner books on digital painting seems to be made for people who know how to paint with real medium. But what if I want to learn how to paint directly with the digital medium? I don't want to read first a book about painting and then another book about digital painting. The end section where they break down each element seems to be the most interesting part of the book that I have not seen in any other book. This is one of the main reason this book seems very interesting to me. I read "Digital Painting for complete beginner". I found many interesting stuff in there even if there is a lot of stuff like scketches I cannot do. So maybe this book still have some interesting element I could use even if I could not produce art as rich as a professional. You would probably need some basic knowledge on painting with this book. Most digital painting books are like this. I use photoshop CS5 as my painting platform. I want to improve my skill but I have limited budget to buy just one digital painting book. Can you recommend if I should buy this one or Digital Painting Techniques: Practical Techniques of Digital Art Masters? Or do you have another recommendation? Thank you in advance. In over all I love it. Still if you are an experienced artist, you could want to check elsewhere. But there are some project that are very detailed in the book. While other articles rapidly talks about the subject without getting into the details. It's also not a book to learn how a software work but rather when you know how to use it but do not know what to do with it.